Windows 8 Quadratic Formula Solver is a free app that is likely to prove quite handy for students and for teachers as well. It is a simple Quadratic Formula Solver Windows 8 app that lets you solve quadratic equations within seconds. It takes the value of coefficients as input and lets you know value of variable within a second. It must be noted that this mathematics application works for solving quadratic equations only. On launching Quadratic Formula Solver Windows 8 app, you will be presented a window with three text boxes and a button beneath. Now, suppose the equation is 2x2+ 3x-9=0, Then you will require entering 2, 3, and –9 in the respective text boxes as coefficient of a, coefficient of b, and coefficient of c.
Next, click on ‘Solve!’ button. In no time the value of variable (x) will be calculated and presented in front of you. Now, suppose the equation is not in standard format then you will require to bring it in standard format before inserting the values. For example the equation is written as 4x2 –2x2 +5x-2x=9. Before being able to solve it on Windows 8 Quadratic Formula Solver you’ll require bringing it in standard format, which will be 2x2+ 3x-9=0. Also, check out our posts on Mathematic Formula Apps, Calculator Apps, and Unit Converter Apps. 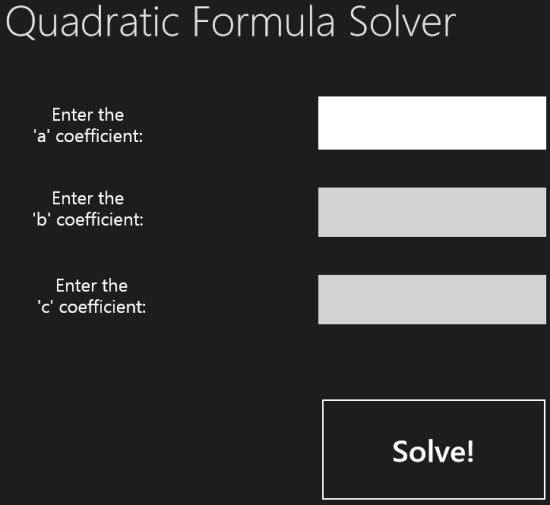 Quadratic Formula Solver can be easily located under Education section of Windows Store. For quick installation you will require opening this link in Internet Explorer 10 or later. Then click on button to the top-left section stating ‘View in Windows Store’. In the Windows Store, click on Install button. The size of the app is only 49 Kb and will install in seconds. Windows 8 Quadratic Formula Solver is definitely a nice option for students in lower sections. The application can be utilized by them to check if the answer calculated by them is correct or not. I have no issues in recommending it. * It will not be a very bright idea to use Windows 8 Quadratic Formula Solver to cheat by getting answer without solving.